"We ingrain the Field Service Quality model as a mandatory business process, which been implemented irrespective of the customer demand." Although the concept of the quality is not new, it is a major pre-occupation in most manufacturing organizations today. It has been a challenging task to measure the quality of the services combining technical and system aspects. However our integrated team effort's from across 33 countries and the execution of various quality models in the service sector has enabled us to evolve and define the quality of service in 1999. A probable first in the wind power sector. Quality of services in the areas of field operations is multidimensional and has powerful creative possibilities in order to enhance the entire systems including the stages of design. To start from the macro stand point, the major challenge is how to define and determine the customer requirements in the listed dimensions and establish continuous improvement strategies to meet and exceed the technical requirements. As we need to draft the common modules including indefinite customer expectations. 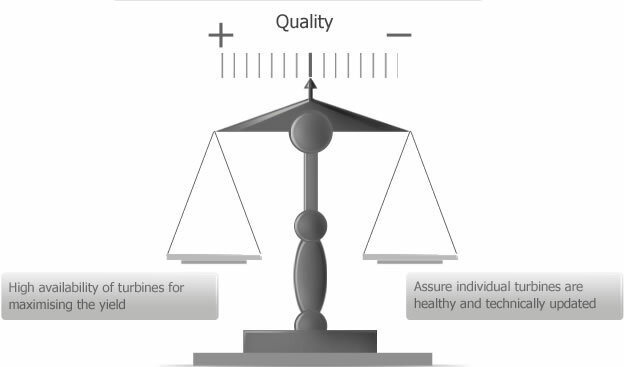 Our service quality module is based on the technical requirements of the wind farms and comprehensive expectations of individual customers across 33 nations; matured over 25 years of sustainable performance. Customer requirements are built into the system at the design stage, and are being transformed to obtain the highest degree of compliance which is determined herein by the Services Installation Quality Assurance (SIQA) module. Competency development of site personnel, including contractual personnel and allied partners. Supporting technical issues evaluation, resolution, trials, implementation and effectiveness monitoring. Facilitating site process optimization and improvement using quality tools like PFMEA, Quality tools, MTTF and MTBF for the higher reliability levels. Assuring the compliance of processes and products across all the sites for projects, installation and operations. To enhance technical compliances and reliability levels and to raise the benchmark of Wind World (India) Ltd. in terms of availability, sustainability and performance yield.